According to a new Fox News poll, most Americans believe owning a gun is an act of Patriotism. 70 percent of voters consider volunteering on a political campaign to be patriotic, 61 percent say the same about participating in a political protest and 50 percent say owning a gun is an act of patriotism. Some 79 percent of Tea Party activists consider owning a gun an act of patriotism, as do 69 percent of Republicans. Democrats (35 percent) and independents (40 percent) are much less likely to feel that way. 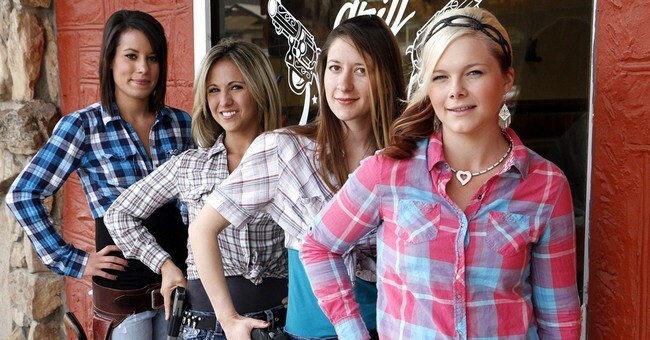 Men (60 percent) say being a gun owner shows patriotism, while over half of women feel it does not (56 percent). Owning a gun is significantly more likely to be seen as patriotic in rural America (65 percent) than in suburban (46 percent) and urban areas of the country (36 percent). This woman certainly believes owning a gun is an act of patriotism. Happy Independence Day everyone and God Bless America.